We have always advocated ITC as a stock because it belongs to FMCG sector which performs irrespective of the inflation or not and this is the reason; it found its way in our Top 10 stocks of India list. However in stock market one has to be dynamic and be ready to mould oneself like water and go with the trend of the market and now ITC has gone below its key support levels. Investors can buy this stock only above 313. Till that short opportunity keeps on existing in the stock. For traders; The level of 300 is going to act as a psychological barrier where any move above 300 with volume can be used for a long trade with stop loss being shifted to 300 level and any break of 300 level is a short opportunity with sl again being 300. Thus 300 is going to act as a pivot level for the short term. 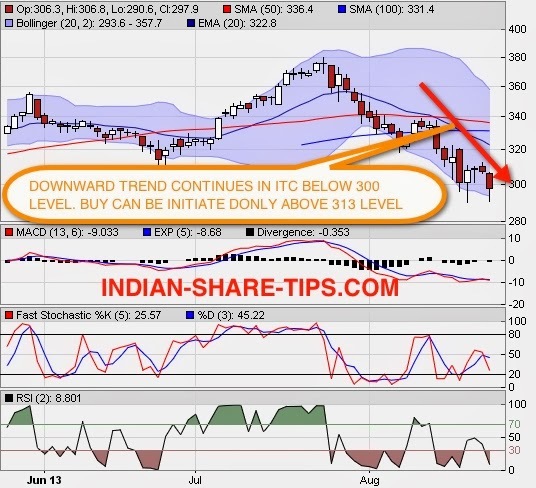 As we can see in the chart stock has achieved its peak at 380 and from that level it has been in a downward pressure. You can check Nifty 50 EOD charts here. Our clients are short in stock since break of 313 level and they have been consecutively short for past 2 days using our sure shot stock tip of the day. This post was written on 28 Aug 13.